TheKing of Monsters is here! As I write this I have the Blue Öyster Cult's Godzilla blaring on the speakers just to get in the proper mood. I can't think of anyone who is reading this who doesn't know who Godzilla is or has not seen any one of the 24 various movies that have starred this 164 foot tall mutant lizard. Most of them are pure camp, and generally an actor in a Godzilla suit who is having fun stomping on a room full of miniatures. It wouldn't be much of a surprise to know that many of the destruction sequences were shot with just a single take! Thanks to American atomic testing in the Pacific, Godzilla (which in Japanese is a mixture of two words for gorilla and whale; Gojira) and a number of worthy adversary mutants have been created. For some reason unknown to mankind all of them seem to focus on Japan in general and Tokyo in particular. The havoc wreaked by these monsters makes the WWII US bombing raids look like a pittance in comparison. Fortunately, science wins out in the end and Godzilla is defeated. 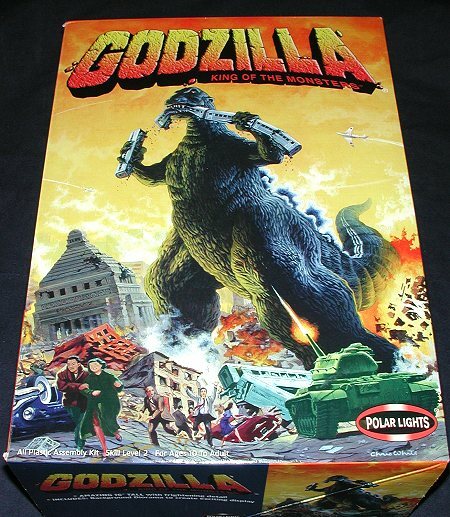 In later movies, Godzilla is as much the hero of the show as he saves the country from creatures nearly as horrific as himself (needless to say, the might of the Japanese defense forces have little effect on these behemoths). Well, it has taken a number of years, but we finally have a monster kit worthy of the King of Monsters. This new tool kit is made in the PRC as are all of Polar Lights models. 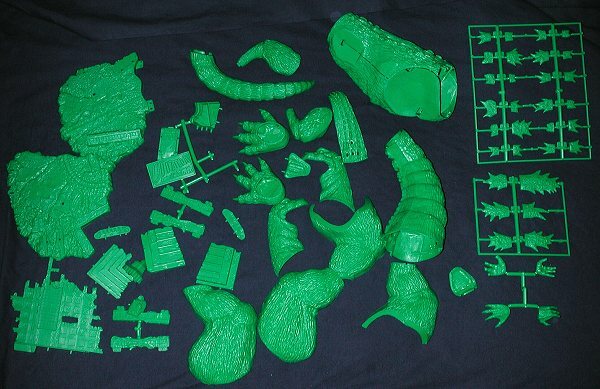 Molded in a very lurid 'atomic radiated mutant' green, the kit parts were no match for the pathetically weak plastic bags in which they were wrapped. Many had escaped into the rest of the box, there to wreak havoc with the other parts of the kit. The box itself is huge and is designed like the much-despised R-M 'donut' boxes. However, in this case it works well as much of the box is designed to be used as part of the overall diorama that is this kit. Yes, in addition to tall, green and gruesome, you get a full diorama, complete with subway trains and a tank. In fact, judging from the size of the tank, I'd put Godzilla pretty close to 1/72 scale. An interesting part of the packing is that many of the larger parts were snapped together as you can see in the image above. Some even had smaller parts inside them. Apparently this makes it easier to get all the pieces into the box. Speaking of pieces, most of them are quite large, the smallest of them being the spines that go along his back. Test fitting a few of the pieces showed that you will be getting familiar with filler for most of the joins as while they fit well, the join areas are rather large. This is typical of other Polar Lights figure kits so if you haven't learned to do seams, this will be a great time to do so. The instructions tell you to paint him in a grey or green-grey color with light blue for along the back of the spines. This should work rather well. Don't forget that he is a lizard so shouldn't be a totally matte color. The opportunity to work on your washes and dry-brushing will be paramount to doing a really good mode. If these things don't sell like hot-cakes, I'll be truly surprised. The kit is very well done and big enough so that it should please all levels of modeler. What's more, it even looks a whole lot more like Godzilla than just about any other model of him that I have seen. If you like your monsters big, then run to your hobby shop and pick yours up before they are all gone!